A multimeter is an important tool when dealing with electronics. Also known as a Volt-Ohm meter, a multimeter allows you to measure several different attributes of an electronic circuit, such as resistance, current and voltage. There are 2 different types of multimeter: Analog and digital. An analog multimeter uses a dial with a pointer to display a measurement, whereas a digital multimeter uses a digital screen to display numerical values. Digital multimeters are more common, and for simple electronics, a digital multimeter is the best option. Multimeters are generally hand held devices, and are useful for quick fault finding in a circuit. Checking a circuit’s completeness and the voltage from a power source are two common uses. There are, however, mains powered, bench multimeters which are used for much more accurate measurements and diagnostics. The Innova 3300 is just about the best multimeter you can get for a few dollars. It’s accurate enough for most uses, and seems rugged enough for a beginner to abuse, or as a handy spare to have knocking around in the garage. The probes do seem a little flimsy, but use a standard fit if you ever need to replace them. The probes also have little clips, which help stop them getting damaged when you wrap them up. There is no sound for the continuity test, so you will have to look at the screen to see if a circuit is complete. This isn’t too much hassle if you’re not checking circuits in hard-to-reach places. There’s no stand either to angle the multimeter towards you, but again, this isn’t really a problem for simple table-top Arduino projects. It doesn’t have an auto-off feature, so make sure you turn it off or you’ll get a dead battery before you know it. All in all the Innova 3300 is a great little budget unit, and more than adequate for most simple uses. You can’t get a better multimeter for less than $20, but you should really go for a slightly better one. 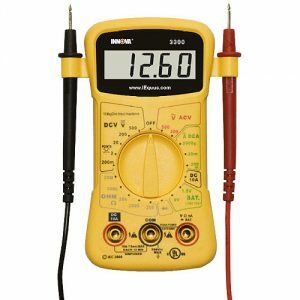 A multimeter for less than $20 is fine for simple tests, but if you can stretch the extra little bit, you want to get something a little better…. The Innova 3320 is a great little multimeter. It’s much better than the Innova 3300 we’ve reviewed above. The build quality is excellent for such an inexpensive unit, and the display is nice and clear. The probes have clips similar to the 3300 above, but feel much more sturdy. The corner guards help stop it breaking when you inevitably drop it. The continuity tester has an audible beep, which means you don’t have to look at the screen (or you can have it silent if you want). It runs off 2xAA batteries (rather than the more expensive 9V batteries), and has an auto-off feature to stop your batteries going dead. The Innova 3320 is also auto-ranging, which means you don’t have to select your input range. It recognises what you are testing, and outputs the desired measurement. This leaves room on the main dial, which is replaced with a battery testing feature. Simply set the dial to the voltage of your battery, and one of the LEDs will illuminate showing the state of the battery. 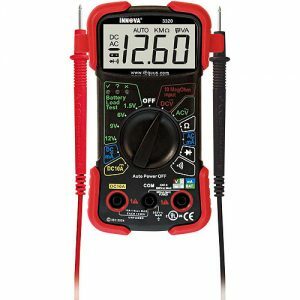 The Innova 3320 is the best multimeter you can buy before you start competing with the big boys. It has features of more expensive units, but with a lower price. You really can’t get better for the price, and it’s clear why it’s the number 1 best seller on Amazon. If you want to do more than just simple tests, you’re going to need a more sophisticated multimeter. If you can afford the extra bit of money, the Extech is a clear winner. The Extech EX330 has an amazing array of features. The Extech EX330 has won countless awards. With its amazing array of features and competitive price, it’s hard to beat. It’s a really solid unit, weighing more than the budget models. The protective case feels tough enough to protect from a hard life in industrial fields. The shear array of features of this multimeter is outstanding. You can test voltage, current, resistance, capacitance, frequency, temperature, duty cycle and diode/continuity. For a multimeter of this price, that’s an amazing array of features. The temperature sensing capabilities alone set this aside from other multimeters in this price range. 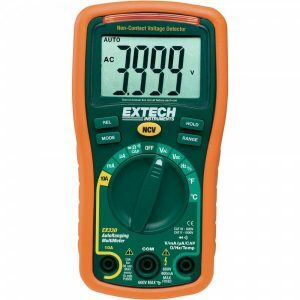 It has the other features you would expect from a multimeter in this price range; a continuity tester, auto-ranging, auto-power-off, tilt stand and runs of 2xAAA batteries. The data readout can also be set to max hold, data hold, and relative. The Extech EX330 is clearly aimed at more professional users rather than hobbyists, but the array of features really sets it apart from the rest. It may be expensive if you are just playing with Arduino for fun, but if you do any other sort of electronics around the house it’s an amazing buy. Remember: if you buy good you buy once! 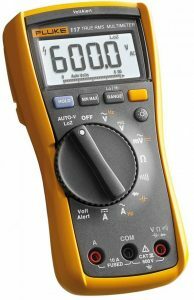 If you’re serious about testing circuitry, you can’t get better than a Fluke multimeter. The 110 series is Fluke’s cheapest range, but the 117 featured here is the best of the range. Fluke don’t do cheap, they do good. Fluke are regarded as the best multimeters on the planet, and the Fluke 117 is on the ‘budget’ end of Fluke multimeters. It’s solidly built, as are all Flukes. It’s a true RMS multimeter and designed with the engineer in mind. It features everything you could possibly need; it can measure resistance, continuity, frequency and capacitance, and has the mix/max/average you need to test fluctuating signals. The backlit display makes it easy to see the reading in any kind of light. This makes a big difference in demanding situations. The low impedance input helps give accurate reading that are caused by ghost voltage. It can handle a ridiculous amount of power and current: up to 600V and 10A! The Fluke 117 is aimed at professional engineers and not for hobbyists tinkering with 5V electronics, but it will still do the job. If you need to accurately test simple and household circuits and require a reliable multimeter that can be calibrated (and have the money to spend), then the 117 is all you will ever, ever need.